President-elect Rodrigo Duterte has said he will press the Philippines' contentious claim to Malaysia's Sabah state, reviving an issue that has mostly lain on a political backburner in Manila for years. "I'll stick to our claim," he said in one of his late evening news briefings on Thursday. He said he would pursue the claim of the Sultanate of Sulu, a group of islands in the south of the Philippines. "What has been the policy will always be the policy of the government, especially those for the interest of the country. We have to stake our claim," he told reporters. It remains unclear how Mr Duterte, who won the post in an election three weeks ago, intends to pursue the case. If pursued aggressively, it could further complicate diplomacy within Asean, which is already divided over how to address China's territorial claims in the South China Sea. There are also disputes over fishing rights in the sea. The Sultan of Brunei gave Sabah to the Sultan of Sulu in 1658, either as a dowry or because troops from Sulu helped him quell a rebellion. In 1878, the Sultanate of Sulu signed a contract, known as a "pajak", that allowed the British North Borneo Company to occupy Sabah in perpetuity as long as it regularly paid the sultanate a sum of money. The British colonial government succeeded the company and, in 1946, Sabah became a Crown Colony. In 1963, Malaya, Sabah, Sarawak and Singapore formed the Federation of Malaysia. While the British and Malaysia interpreted "pajak" to mean "sale", the Sulu Sultanate has always maintained it means "lease". Even today, Malaysia pays about RM5,000 (S$1,680) a year to the Sulu Sultanate. Successive Philippine presidents have pressed the Sultanate's case, including an attempt by the late President Ferdinand Marcos to train and equip a secret Muslim militia to take Sabah by force in 1967. 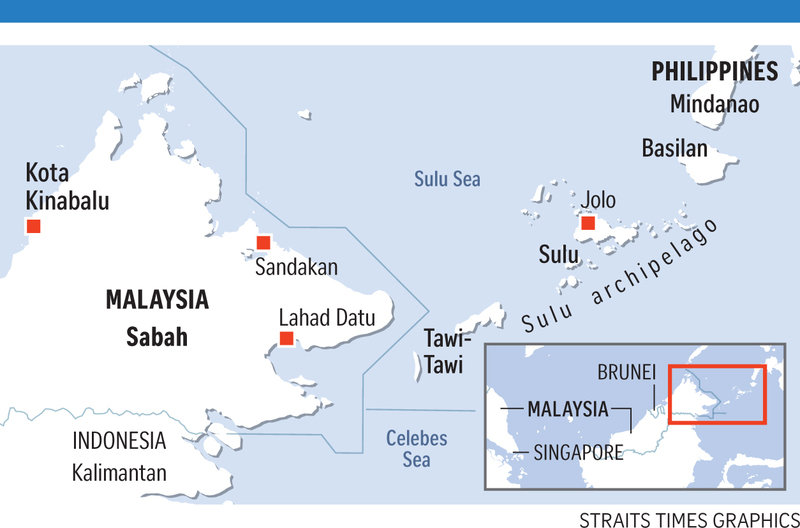 In February 2013, about 200 armed Sulu men laid siege to Lahad Datu, Sabah, leading to firefights with Malaysia's security forces, and killing some 100 people. Mr Duterte, mayor of the southern city of Davao for two decades, has set out to mend fences with the communists and Muslim rebels . Malaysia's Ministry of Foreign Affairs responded, saying Kuala Lumpur "reiterates its position that Malaysia does not recognise and will not entertain any claims by any party on Sabah". "Sabah is recognised by the United Nations and the international community as part of Malaysia," it added. In 2013, Mr Esmail Kiram II encouraged a last-ditch, violent effort to regain Sabah. A militia of more than 200 men landed near Lahad Datu on Sabah's east coast, laying siege to the neighbouring area. The attack strained Malaysia's ties with the Philippines. Analysts said Mr Esmail Kiram II launched the attack to draw attention to the Sulu Sultanate's claim, after President Benigno Aquino set it aside as he tried to hammer out, with Malaysia's help, a peace deal with Muslim rebels in the south.